WAND Taxonomies Blog: WAND Fleet Management Update! This month we reviewed and updated the WAND Fleet Management Taxonomy. The focus of this update was to review the current taxonomy and look for additional terms, and synonyms. 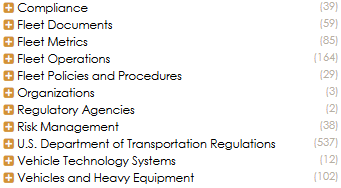 The updated WAND Fleet Management Taxonomy has 1,081 categories and 250 Synonyms. Fleet Metrics and Vehicle Technology Systems have been added to the top level terms. Fleet Tracking, as a narrower term of Fleet Operations, and the U.S. Department of Transportation Regulations have been expanded. This taxonomy includes the areas of Compliance, Documents, Policies and Procedures, Vehicles and Heavy Equipment, and Risk Management. There are also terms relating to Fleet Organizations and Regulatory Agencies.